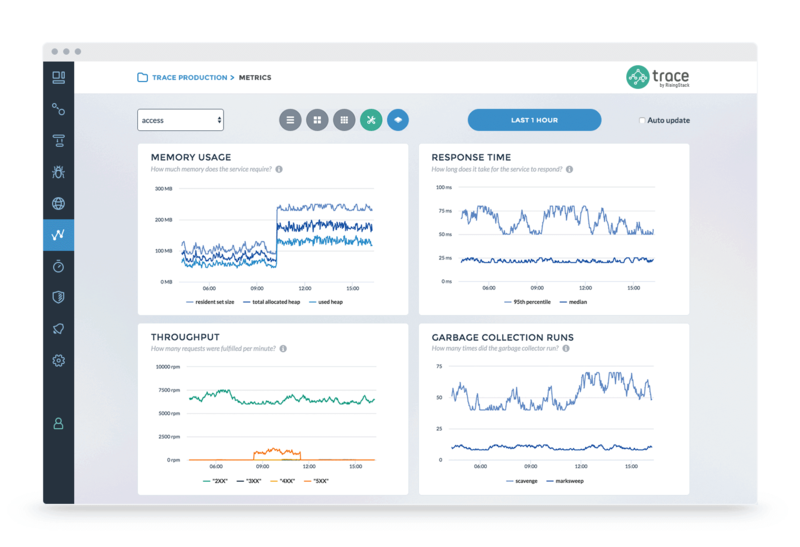 Today, we’re excited to announce that Trace, our Node.js monitoring & debugging tool is now free for open-source projects. We launched Trace a year ago with the intention of helping developers looking for a Node.js specific APM which is easy to use and helps with the most difficult aspects of building Node projects, like..
Why are we giving it away for free? We use a ton of open-source technology every day, and we are also the maintainers of some. We know from experience that developing an open-source project is hard work, which requires a lot of knowledge and persistence. Trace will save a lot of time for those who use Node for their open-source projects. How to get started with Trace? Visit trace.risingstack.com and sign up - it's free. Connect your app with Trace. Head over to this form and tell us a little bit about your project. Done. Your open-source project will be monitored for free as a result. If you need help with Node.js Monitoring & Debugging..
Just drop us a tweet at @RisingStack if you have any additional questions about the tool or the process. If you'd like to read a little bit more about the topic, I recommend to read our previous article The Definitive Guide for Monitoring Node.js Applications. Commercial Node.js support, aimed at enterprises with Node.js applications running in a production environment. RisingStack now helps to bootstrap and operate Node.js apps - no matter what life cycle they are in. Disclaimer: We retain the exclusive right to accept or deny your application to use Trace by RisingStack for free.